You will find friends and customers of Yankee Doodle in communities like Wilton, Ridgefield, Norwalk, Easton, South Salem NY, Stamford, Greenwich, Newtown, Pound Ridge NY, and throughout many areas of Fairfield, Westchester, and Litchfield County. Browse some of the Accessories we offer online in the Web Store. We carry a large selection of functional and decorative hearth accessories to meet your needs and desires. 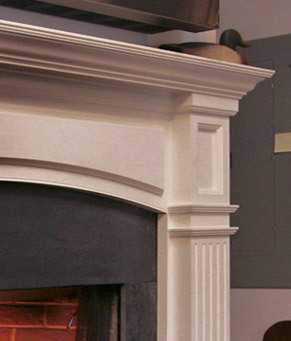 As specialists in stoves, fireplaces and inserts, we know how important hearth accessories are. Whether you need a new set of tools for your wood stove or a fireplace screen that will protect your little one from getting too close to the fire, we have what you are looking for in a style that will complement your home décor. Our customers throughout Connecticut in Fairfield County, Litchfield County, and Western New Haven as well as in Westchester County, New York know that we pride ourselves on carrying everything you need to enjoy your fireplace, fireplace insert or stove. Visit our showroom to browse our collection and find the perfect accessory for your fireplace or stove. A mantel shelf is one of the most popular decorative fireplace accessories. Whether you embellish your mantel with family photos or seasonal decorations, the mantel is often the focal point of the fireplace. Simply by installing a new mantel shelf you can transform the look of an outdated fireplace. We offer unfinished and prefinished mantel shelves in a wide range of styles and colors/ finishes. Our friendly staff would be happy to help you find a mantel shelf that will make a statement in your home. 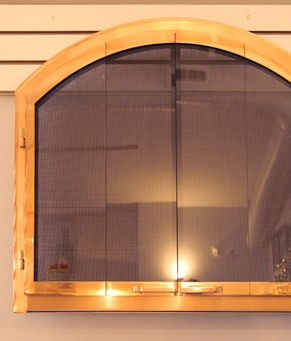 Fireplace screens are both functional and decorative accessories. 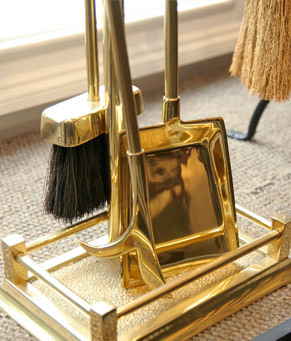 Their primary purpose is to prevent sparks and embers from flying out of the fire onto furniture or carpet. They also prevent animals and children from getting too close to a roaring hearth. Along with these practical purposes, they are an attractive fireplace accessory that adds character to a hearth. 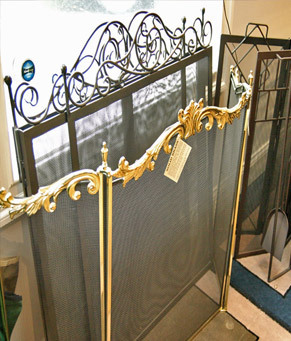 Our selection of fireplace screens ranges from simple to ornate so that you are sure to find a screen that will complement your fireplace. Hearth pads and stove boards are necessary to protect the flooring in your home from being damaged or catching fire from your fireplace or stove. While they are required by code, we believe they should also be an attractive addition to your home. We offer stove boards and hearth pads in a variety of sizes, colors and shapes so that you can choose one that complements your home décor. Fireplace doors are protective accessories that also increase the energy efficiency of a fireplace. Along with preventing sparks and embers from drifting out of the hearth, fireplace doors prevent you from being chilled by a down draft and stop your heat and air conditioning from escaping up the chimney. We offer ceramic and tempered glass fireplace doors that allow you to enjoy the full view of the fire. We have other doors that will make a stylish statement. If you are looking for replacement doors for a zero clearance fireplace or fireplace insert, we would be happy to help you. Tool sets are valued as much for their design and aesthetic appeal as their usefulness. All of our tool sets are designed to be both functional and attractive so that you do not have to have a separate set to properly maintain your wood burning stove or fireplace. Our tool sets include shovels, tongs, brooms and pokers in different styles and finishes to appeal to your unique taste. There isn’t enough space to mention the long list of additional hearth and home items that we carry to improve the look and functionality of your fireplace and stove. The short list includes kettles, fans, fire starters, log racks, bellows, ash dumps, pipe dampers, trivets, matches and match holders, grills, registers, hearth rugs and so much more. Browse our collection for yourself to find accessories that will make you excited to light up your fireplace or stove.